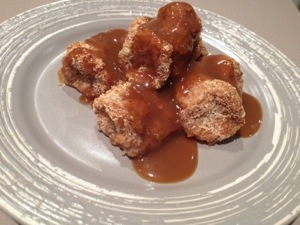 My mum has always made the most delicious butterscotch sauce, usually served drizzled over a slice of pumpkin flan – deliciousness!! It was one of those foods that as a child I’d hide behind the open door fridge and finger-scoop straight out of the container into my mouth. Butterscotch sauce and chocolate ganach – couldn’t (and still can’t!) resist! It sets and goes fudgy once it’s cold, so perfect for sneaking big spoonfuls! I think it could be eaten on just about anything, but it’s super special on ice cream, pancakes, waffles, crepes or French toast. Paired with these baked bananas, it’s a treat that you could eat any time of day. The bananas go crispy on the outside and soft in the middle once baked and only have a tiny bit of spray oil – so they’re actually quite healthy…until you add the sauce! They are also gluten free, as is the sauce – so great for my coeliac friends. Eat them while they’re hot and fresh out of the oven, drizzled (or in my case, swimming!) in butterscotch sauce. 1. Preheat oven to 200 degrees celcius. Line a baking tray with baking paper. 2. Mix almond meal, coconut, 1 tsp brown sugar and cinnamon in a bowl and mix to combine. 3. Peel bananas. Cut each banana into four logs. 4. Whisk egg white with fork in a bowl until smooth. Roll bananas in egg white in batches and then roll in almond coconut mix. 5. Place your coated bananas on the baking tray, lightly spray with oil and bake for 10 minutes or until golden. 6. To make sauce: Put sugar and butter into a small saucepan and whisk until butter is melted and sugar is dissolved. Add cream and stir to combine. Simmer until sauce thickens. Serve the bananas hot drizzled with sauce. Store the sauce in an airtight container in the fridge for up to one week.